This White Powder Gold was made using a variation of the John Hudson method with Green French Clay Powder, Organic Dolomite Lime, and reconstituted Dead Sea Salt Water. French green clay is a substance that is used for external cosmetic treatments as well as some internal applications by practitioners of alternative medicine. It was used in ancient Egypt, Greece, and Rome to treat a variety of skin problems and digestive disorders. From the standpoint of mineralogy, French green clay belongs to a subcategory of clay minerals known as illite clays, the other two major groups being kaolinite and smectite clays. Clay minerals in general are important because they make up about 40 percent of such common rocks as shale, and they are the main components of soil. Illite clays are usually formed by weathering or by changes produced in rich minerals by heat and acidic ground water. They often occur intermixed with kaolinite clays—which are typically used in the ceramics industry. Illite clays have been used successfully by environmental managers to remove such heavy metals as lead, cadmium, and chromium from industrial wastewater. French green clay takes its name from the fact that rock quarries located in southern France enjoyed a virtual monopoly on its production until similar deposits of illite clays were identified in China, Montana, and Wyoming. The clay's green color comes from a combination of iron oxides and decomposed plant matter, mostly kelp seaweed and other algae. Grey-green clays are considered less valuable than those with a brighter color. The other components of French green clay include a mineral known as montmorillonite, as well as dolomite, magnesium, calcium, potassium, manganese, phosphorus, zinc, silicon, copper, selenium , and cobalt. French green clay is prepared for the commercial market by a process of sun-drying and crushing. After the clay has been mined, it is spread in the sun to remove excess water. It is then ground by large hydraulic crushers and micronized, or finely pulverized. The last stage in the process is a final period of sun-drying to remove the last traces of water. 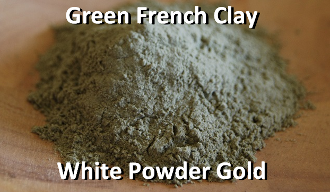 French green clay is available in a dry powdered form for a variety of uses as well as in premixed soaps, scrubs, facial powders, and masks for cosmetic purposes. French green clay is most commonly used in the United States and Canada for cosmetic purposes, as distinct from medicinal treatments. It is regarded as a useful treatment for stimulating the skin and removing impurities from the epidermis (outermost layer of skin cells). The clay works by adsorbing impurities from the skin cells, by causing dead cells to slough off, and by stimulating the flow of blood to the epidermis. As the clay dries on the skin, it causes the pores to tighten and the skin to feel firm. Other external uses for French green clay include poultices to treat arthritis, sore muscles, and sprains; ready-to-use pastes for application to cuts, bruises , insect bites, stings, and minor burns ; and mineral baths for stress relief. Some practitioners maintain that the plant matter in French green clay has anti-inflammatory as well as antiseptic or bactericidal properties. It is interesting that a group of Italian researchers reported in 2002 that French green clay powder is as effective as salicylic sugar powder in preventing infection of the umbilical stump in newborns. The clay powder was found to be superior to powders containing colloidal silver , antibiotics, or fuchsine. Internal uses of French green clay are more popular in Europe than in North America, although some American alternative healers recommend drinking or gargling with solutions of French green clay to cleanse the digestive tract, treat nausea or other gastric disorders, ease menstrual cramps, or relieve sore throats. It is claimed that French green clay absorbs toxins from the stomach and intestines as well as neutralizing radioactivity in the body. A French naturopath states that the copper in the clay fights infections , the cobalt helps to prevent anemia , the selenium aids liver function and slows down the aging process, and the other minerals restore the body's overall equilibrium.